Acres of fish, tearing the water up…that’s what we had on our afternoon trip with William and his group! Blues, rock, macks…plenty to go around! Good fun…good stories…good eatin’! 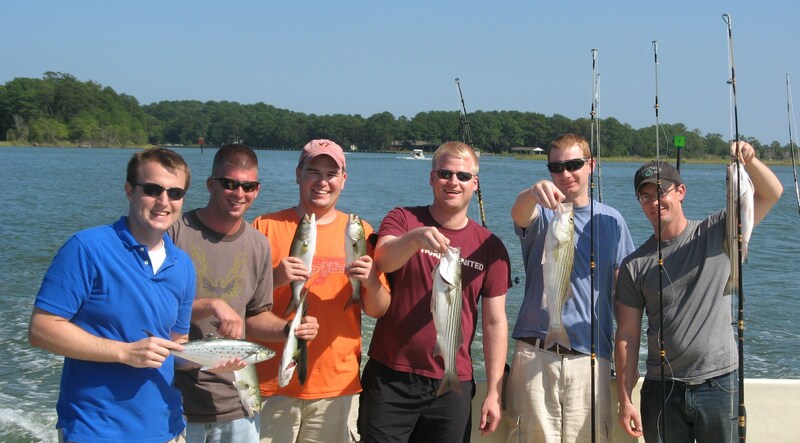 Thanks for fishing with us – we appreciate your business! We were lucky enough to meet and fish with a great group of guys from West Virginia for 2 days. On Friday we caught 120 blues and a nice shot of rockfish and some nice Spanish mackerel. Even though we didn’t have sun, Saturday was filled with more fish and fun. Thank you Chris for organizing your gang of hunting buddies. We hope you all will return again and fish with us…really appreciate your business. One of the many benefits of being a charter captain for many years is fishing with the same good folks again and again! And today, we were lucky that Lee and his group made it a “couples day” by bringing the ladies along. We had a great day, which was topped off with our limit of rockfish and 2 citation Spanish mackerels! 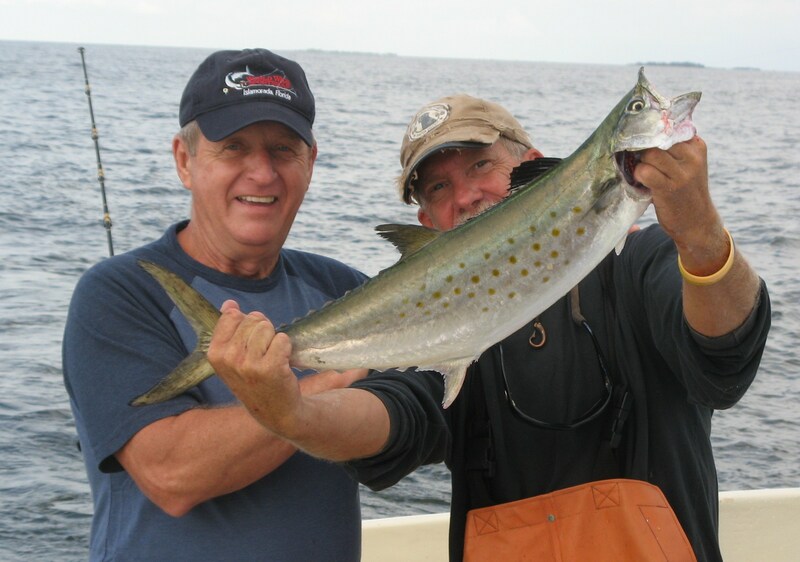 Congratulations Lee on catching the largest Spanish mackerel this season – a beautiful 6 lb. 8 oz. citation! One of our lady anglers also caught a 4 lb. 6 oz. citation. Appreciate your business! Appreciate the opportunity to fish with Jonathan and his group. 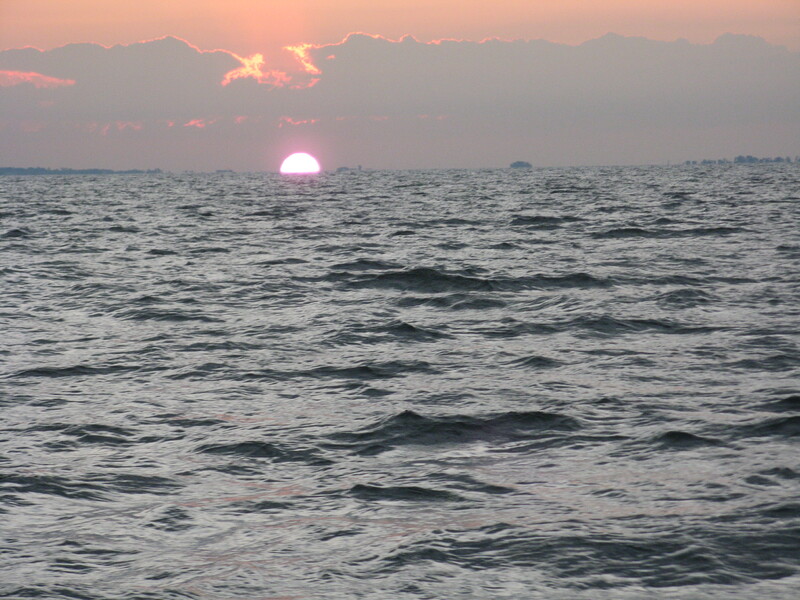 We got an early start – wish everyone could wake up to this kind of sunrise over Smith Island! 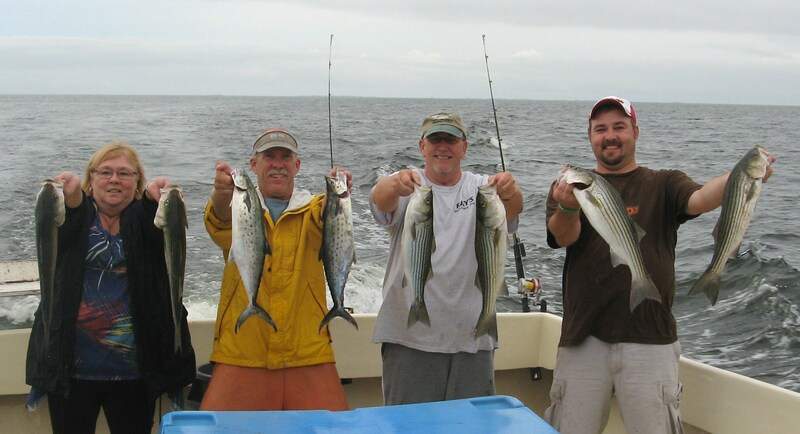 We worked hard to give these fine fellows a great fishing day, bringing home a catch of stripers, bluefish, and a few good size Spanish mackerel. Thanks very much for fishing on KIT II – hope we will be able to fish with you all again in the future. 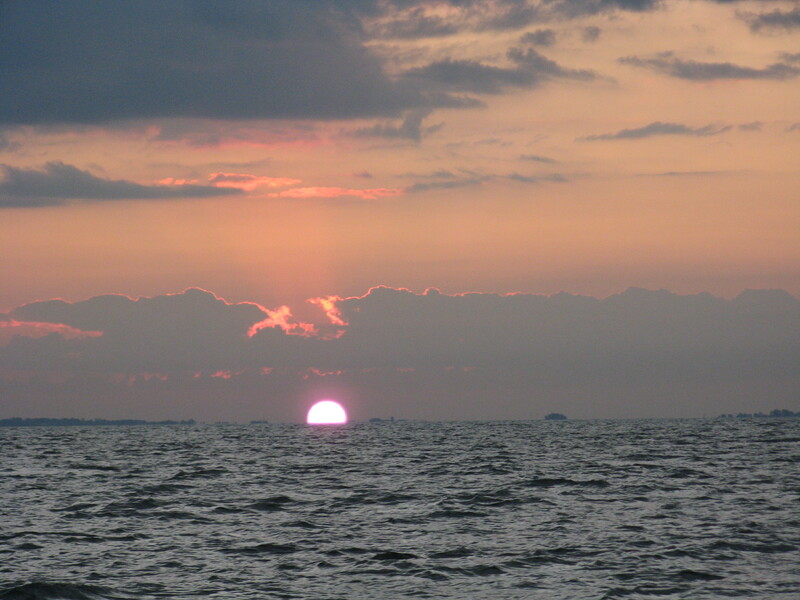 Every day on the Chesapeake Bay is a beautiful one…time to wake up Smith Island! It’s really good when folks you haven’t seen for a long time decide it’s time to go fishing! We were very glad to have Mike back with us after many years and we did our best to give him and his group a great day on the Bay. We hit the rockfish just right, getting our limit of stripers. Our day was rounded out with a beautiful catch of Spanish mackerel and blues. Can you guess who caught the biggest fish? Hint: she is wearing her complimentary Crabbe’s Charter Fishing green t-shirt!! Hope to see you all again soon…appreciate your business! Always glad to have Roger back fishing with us. He organized a great group and we were lucky enough to catch our limit of rockfish – the first stripers in quite a long time! Good legal size of 18 – 28 inches. A great sign that rockfishing will pick up strong! 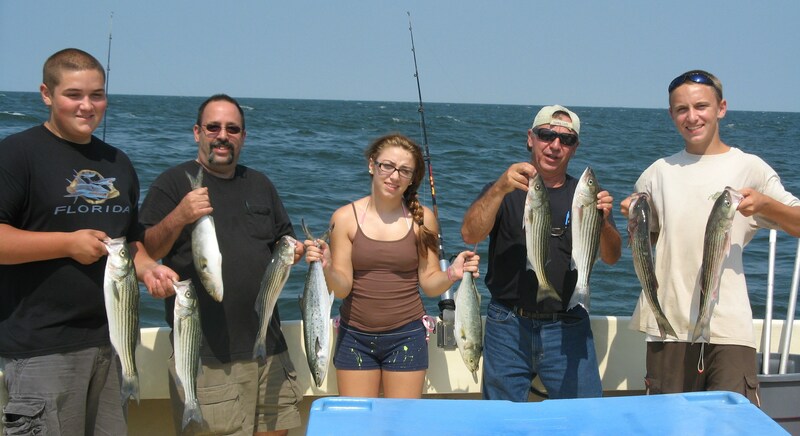 We also had a nice catch of Spanish mackerel and blues. Appreciate your business Roger!